The year 2017 witnessed two very different approaches to urban informal settlements in one city—Lagos, Nigeria. The largest city in Africa, Lagos epitomize the tension between tremendous economic potential and the overwhelming urban planning challenges posed by massive growth and rapid urbanization. 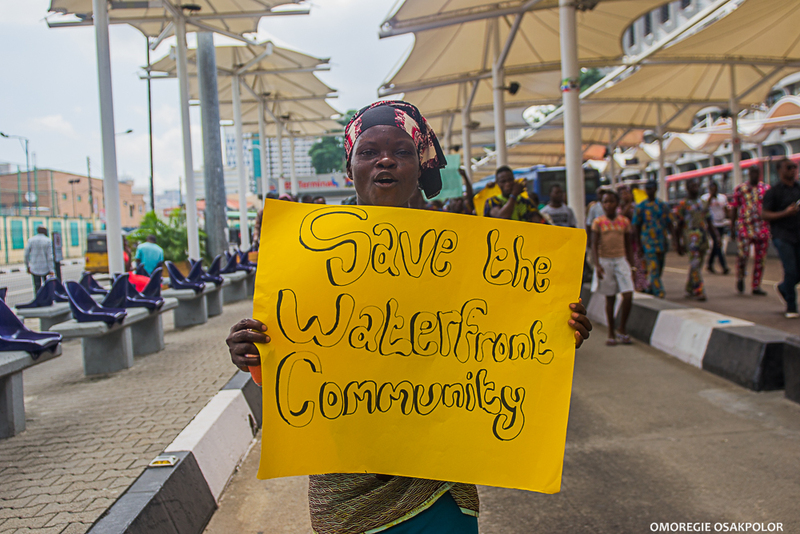 Within the space of a few months, one agency of the Lagos State Government carried out a massive forced eviction of over 30,000 residents of the Otodo Gbame community, an ancestral fishing settlement on the shores of the Lagos Lagoon. The eviction destroyed many hundreds of thousands of dollars’ worth of property, rendered tens of thousands homeless, and resulted in at least 11 deaths from drowning and gunshots. Evicted residents were literally chased off valuable urban real estate in the upscale Lekki area of Lagos and into wooden fishing boats in the lagoon. They fled by the thousands to no fewer than 16 other informal settlements on the waterfront, where most are still homeless and living in deep poverty. The seized land is meanwhile being rapidly developed into yet another luxury real estate venture, which will likely sit half vacant while the city’s enormous affordable housing deficit grows wider and informal settlements multiply to fill the gap. During the same year, another agency of the Lagos State Government was—for the first time in the city’s history—opening up dialogue with residents of dozens of informal urban settlements organized under the auspices of the Nigerian Slum/Informal Settlement Federation, with a view toward partnership in gathering community-led data and planning toward holistic in situ community upgrading. A peer-to-peer exchange for Nigerian slum community and government representatives to Nairobi, hosted by their Kenyan slum federation and government counterparts, provided an opportunity to see viable eviction alternatives forged by communitygovernment partnership. As a result, the Lagos State Urban Renewal Agency (LASURA) and the SDI-affiliated slum dweller federation started the process of building the mutual understanding and trust that are essential to reversing a history of violent evictions and demonstrating alternatives for inclusively transforming the city. These starkly different strategies for urban development and the choices they represent reveal the potential for Lagos to be a city of large-scale tragedy or large-scale opportunity. The human and development costs of evictions are enormous. For evicted households, the results include homelessness; loss of livelihood; negative health consequences, even death; separation of family and loss of social support systems; interruption of education; and overall worsened living conditions. These consequences are not limited to the immediate term but have lasting effects on urban poor households. Research conducted among victims of the February 2013 forced eviction in Badia East—another Lagos informal settlement—showed that 2.5 years after the forced evictions, over a third were still homeless, and over 80 percent were living in shelters worse than the homes they inhabited prior to the demolition. More than half were separated from family, and a third of children had been unable to resume schooling. Virtually all described their incomes and access to work as worse or much worse.1 Similar findings are reported on the long-term impact of the forced evictions of the Njemanze and Abonnema Wharf communities in Port Harcourt, Nigeria. Nothing leaves people behind as evictions do. Forced evictions are a betrayal of the SDGs we signed up for. A large-scale eviction affecting tens of thousands of urban poor residents undermines progress toward achieving the Sustainable Development Goals (SDGs) on poverty, health, education, access to basic services, and sustainable urban development. Government officials routinely try to justify large scale forced eviction on the grounds that such displacement will improve city security, sanitation, and the environment and will enable implementation of a master plan. But evicted communities do not disappear from the city; rather, the population forcibly displaced from one location simply moves to or creates a new informal settlement and does so with far fewer assets. Far from creating a more secure city, such mass displacement leaves affected populations desperate and erodes trust in government and law enforcement. In short, the city’s resilience is massively reduced. As the Nigeria federation and its partners seek and develop win-win eviction alternatives, they do so in solidarity with their peers from the SDI network. In cities across the globe, the experience of mass forced eviction and the manifold negative consequences of such evictions gave rise to these slum dweller movements. Organized communities have leveraged grassroots knowledge and the capacity to change urban policy and practice while developing strategies to protect and improve settlements. Over decades, in response to and in dialogue with these movements, city governments have found ways of working with the urban poor to craft win-win alternatives to eviction with improved outcomes for communities and the city as a whole. Looking across countries, workable alternatives to eviction can be driven by innovations in policy, practice, and finance. Policy-driven alternatives are those that grow out of policy innovations that unlock investment in in situ slum upgrading. In some countries this has been achieved through innovations in land titling to enable the urban poor to secure tenure and, consequently, invest more in their housing and community infrastructure. Other policy innovations target the private sector, incentivizing investment in housing and infrastructure for the urban poor. For instance, in India, policymakers, in consultation with the SDI-affiliated slum dweller movement, designed a Transferred Development Rights (TDR) scheme by which developers could obtain the right to build high-end housing with augmented density in exchange for building free housing for the urban poor. Innovations in practice involve partnership between governments and organized communities to directly upgrade or resettle informal settlements, at times with participation by global development partners. Examples include the large-scale railway resettlement programs in India and Kenya, in which SDI-affiliated slum dweller federations led enumerations of people living within railway line setbacks and then worked with the government to plan, organize, and implement resettlement programs. In India, strong partnership and highly organized communities enabled the resettlement of 60,000 in just one year. In Kenya, nearly 10,000 have already been resettled in situ and the program is ongoing. Housing units were constructed on the same land after clearing the 20 meters closest to the rail line through consolidation of households into three-story housing in the remaining 10 meters. Even where third-party financing may not be available for rapid and large-scale resettlement, organized communities working in partnership with government may still plan for and implement community-led upgrading. An example is in Kambi Moto community in Nairobi, where the SDI-affiliated savings groups in the community negotiated a Memorandum of Understanding with the government. The government agreed to transfer land title to the community in exchange for a land readjustment and upgrading plan whereby residents used their savings and SDI-supported soft loans to build improved housing, going vertical to make more efficient use of the land and making available a plot for a government building. The layout and process are continuously being improved and have been replicated in other Nairobi slums. Innovations in finance, as well as in policy and practice, are essential to unlock slum dwellers’ capacity to invest in the upgrading of their own communities. To this end, SDI-affiliated slum dweller movements across the world have been working with city governments to establish and grow Urban Poor Funds. Such funds pool capital from their members and third-party sources to finance investments in land, housing, and related projects. An example is the community-managed uTshani Fund, established in 1995 by the South African SDI affiliate with an initial USD 2.7 million pledge from the Minister of Housing. The uTshani Fund uses donated capital to pre-finance innovative community-based housing design and delivery through bridge loans, which revolve back into supporting new projects. To date, the fund has used its initial grant capital to secure land and build over 13,000 houses. In each of the successful examples of alternatives to eviction given above, a key to crafting workable innovations in policy, practice, and finance is strong partnership between organized communities and government. Against a history of evictions, it may take time to build trust and mutual understanding to enable such partnership, but the sustainable outcomes—upgrading slums and delivering affordable housing for the urban poor without recourse to evictions—are better for communities and for the city. This is the process that LASURA and the Lagos chapter of the Nigerian Slum/Informal Settlement Federation have embarked on, following in the footsteps of other SDI-affiliated movements and their government partners around the globe. The Lagos chapter of the federation comprises hundreds of savings groups in over 80 settlements across the megacity; of these, the federation has identified three settlements with the strongest savings groups and highest level of contributions to the Nigerian Urban Poor Fund as priorities for upgrading in partnership with LASURA. During the initial phase, the federation has led household-level enumerations in two of the priority communities, with LASURA’s research department joining the fieldwork so that they can understand the process and help validate the data, which will be essential for planning. The federation has also convened a series of large town hall meetings in which community members engage directly with LASURA around upgrading priorities and data-based planning. While building the foundation for partnership, dialogue is beginning on how best to drive eviction alternatives on a megacity scale: Should this start incrementally? Should it involve a development partner? Are policy changes needed to unlock investment? What is the role of private developers? How can communities remain in the driver’s seat if private developers are involved? What is the best way to overcome the legacy of evictions and avoid the pitfalls of the past? One thing is for certain: as this partnership takes shape, it will not only make history in Lagos, but it has the potential to tap into the innovative and entrepreneurial spirit of Nigerian slum dwellers to develop new approaches to eviction alternatives. It will simultaneously pose and answer the most pertinent question of all: What happens once an eviction has been prevented? The UN Habitat conferences are meetings of world stakeholders on human settlements that take place every 20 years. The two prior UN Habitat conferences were held in Vancouver, Canada (1976) as Habitat 1, and Istanbul, Turkey (1996) as Habitat II. The primary idea is that we can not ignore the growth of cities and the attendant challenges, instead we must plan ahead so that those challenges will not take us by surprise and overrun us. The main issues the UN Habitat conferences consider are defined by the prevailing challenges during the preceding two decades. Key issues discussed at UN Habitat 3 were urban poverty, slums, slum dwellers vulnerable and marginal groups (including women, girl child, disabled persons), socio-spatial exclusion (i.e. segregating the poor from the rich in physical planning), governance, equity and equality, environmental justice, participatory planning, right to adequate housing, security of tenure, slum upgrading and prevention, inclusive finance, informal economy, and climate change (not pronounced in Habitat 2). Attendees included high-level government representatives (primarily those working on housing, urban governance, and environment), as well as stakeholders from many grassroots organizations like the Shack/Slum Dwellers International (SDI), Women In Informal Employment Globalizing and Organizing (WIEGO), Huairo Commission (HC); many public and private research and development institutions; donor agencies, and the press. In March 2016 we hosted a team from Northwestern University Access to Health (ATH) comprised of both faculty and students in Lagos for a week-long engagement to identify key obstacles to good health for the urban poor. From this trip, and based on the Federation's interest in tackling some of the health challenges facing residents of informal settlements in Lagos, together with ATH we developed a health education curriculum for training nominated Federation members as Community Health Educators (CHEs). The aim of the collaboration is to improve knowledge among residents of informal settlements by sharing health information through the Federation's savings group structures, and offering health accompaniment to health facilities for those in need of health services. The SDI delegation in attendance was comprised of members of both the Nigerian and Ghanaian Federations and support NGOs. Although not all of our suggestions were ultimately reflected in the Regional Meeting outcome document, termed the Abuja Declaration, many of our key priorities appeared in its recommendations. Pasted below are portions of the first three recommendations contained within the Abuja Declaration, with the sections reflecting our contributions highlighted in yellow. Nowhere in the document are the “urban poor” specifically identified as a key constituency in the New Urban Agenda. Although the general reference to “participatory approaches and consultative frameworks” in Recommendation 2 is important recognition of the need for inclusion in urban planning and governance, the Abuja Declaration doesn’t clearly spell out who must be included. The terms “slums” and “informal settlements” only appear once (and only in reference to creation of disaster resilient infrastructure in Recommendation 5). Instead, the Abuja Declaration focuses intensely on the concept of “human settlements” (which specifically appear on 21 occasions throughout the document) – which are notably neither specifically poor or even urban. Indeed on no less than 8 occasions in the Abuja Declaration there is reference to “urban and human settlements” which suggests that the New Urban Agenda is not necessarily urban-focused. There is only one mention of “rights” within the Abuja Declaration (in Recommendation 2), which merely suggests that they should be “taken into account,” rather than referring to the foundational human rights framework of ‘protect, respect, promote, and fulfill.’ This is a notable shift from the UN Habitat 2 outcomes, which were more firmly grounded in the human rights framework and language. This is particularly problematic where development-based displacement, and violent forced evictions of the urban poor continue unabated in many African countries, particularly Nigieria. It is also notable that there is no mention of alternative land tenure models or land and property rights specifically in the Abuja Declaration – although this is not surprising, as there was very little mention of either throughout the plenary discussions by the governments and experts in attendance. Indeed, the only concrete mention of rights during the formal plenary came during the presentation of Justice Ntaba of Malawi – whose voice and perspective was singular on this point (see above section on the ‘Main plenary sessions’ for further elaboration on her presentation). There are only two mentions of “local governments” and one mention of “decentralized urban management” within the Recommendations of the Abuja Declaration, suggesting that the local governments are merely one of a list of actors that need to be “empowered” (see Recommendation 3) and “strengthened” (see Recommendation 5). Moreover, there is no mention of the need to links and active partnerships between local governments and organized communities of the urban poor. There only mention of the 2030 Agenda for Sustainable Development is with regard to strengthening UN Habitat (see Recommendation 7), and there is no mention of the need for the organized urban to be key partners in implementing and monitoring the Sustainable Development Goals.